Poor Bonnie won't be attending any holiday parties this year. Despite the valiant efforts Elena and Damon on The Vampire Diaries Season 6 Episode 9, our favorite witch was left all alone in 1994 to conclude the penultimate installment of 2014. Will she return to her friends in time for Christmas? No, at least not in real life. But the official CW synopsis teases how Bonnie will reminisce about the good old days in Mystic Falls (as previewed in the following photo gallery), despite the fact that things are anything but good there these days. Jo, for example, will go missing on The Vampire Diaries Season 6 Episode 10, prompting Alaric to call on Damon and Elena for assistance; while Liv and Luke clash with Tyler over the latter's risky plan. 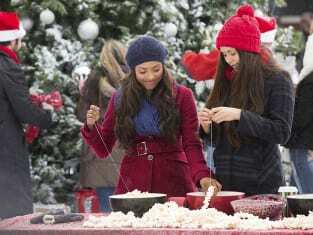 Caroline, meanwhile, will be pleasantly surprised by her mom bringing Christmas to Whitmore, only to later receive devastating news from Stefan. Finally, Jeremy and Matt will team up to take down Enzo, but check out the above preview all the way until the end. The latter appears to have the upper hand on his human foe, doesn't it?